In January of 2006 I received in what I believe to be a transmission from Thoth information on what he calls the Nefer’Ratem (also known in ancient Egyptian texts as the Companions of Horus). I found what he revealed to me on this topic to be powerful and felt called to move more deeply into it. This article is the result of my akashic exploration. The Nefer’Ratem are guardians of the stellar / earth dynamic that is capstoned and focused through the Sphinx on the plain of Giza in Egypt. Before I go further with the recent understanding I have received on the Sphinx and it’s connection to the Nefer’Ratem, I wish to preview past material I have received on the Sphinx as a Solar dynamic and it’s original form as I perceived it through the Record of Thoth. The Lion of Leo represents the passage between the lesser Solar Logos - the astronomy of our physical sun, and the greater Solar Logos. Thoth has told us in the past that Leo was the constellation of access to the Golden Star of Mazuriel, which is the highest ‘threshold level’ Solar Logos for all worlds of this universal system. Ultimately, the Golden Star of Mazuriel represents the full Christic consciousness, and thus represents the future consciousness of this and many other worlds. The Solar Logos of Earth’s true planetary design in the ultimate configuration involving our physical sun, Rigel and Mazuriel, is the Blue Star Rigel in Orion. With the Golden Star of Mazuriel in the picture, the Solar Logos associated with the Blue Star Rigel becomes an intermediary logos, or bridge between the consciousness of our current physical sun, and that of the Golden Star of Mazuriel. Thus the Solar Logos of the Blue Star Rigel will generally be referred to as the greater Solar Logos for the Earth herein, and for all intents and current purposes it is. However, in the next level of cosmology beyond that logos, the Solar logos of the Golden Star of Mazuriel would truly be the greater Solar logos for all worlds in this universal system. The Blue Star Rigel is the greater Solar logos only for the Earth and Venus to our knowledge at this time, but it is the stepping stone to the Solar logos of the Golden Star of Mazuriel. Keep in mind that when we are speaking of Rigel being a stepping stone to the consciousness of Mazuriel, the stellar representative of the Christ, we are looking at some very long cycles in terms of linear Earth reality, literally many thousands of years. But in the higher dimensional realities where time is not so large a part of the reality, it is but one revolution on the spiral of the cosmic clock. This entire cosmology involving more than one Solar Logos (as well as the lion / Lion symbology) is also seen in the Sphinx’s history according to Thoth. In the original rendering of the Sphinx, Thoth tells us that it was a female human body with a Lion’s head, then later it was changed to the body of a Lion with a human head: female at first, then later it was changed to be a male head. 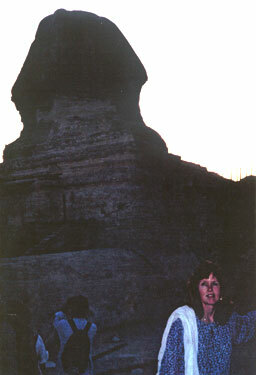 The Sphinx, despite its current appearance (as opposed to the original version Thoth revealed to us), still contains much of the original Light which it was imbued with, and can currently be used to access the vibratory frequencies of that original consciousness, if one but understands how to move through the more recent ‘maze’ of vibrations that overlay the original energy that was programmed in stone. This is actually nowhere near as difficult as it is to access those same consciousness codes through most of the other remaining ‘ancient’ temple structures in Egypt, as most of those were not even built during the ‘Time of the Light’, but much later upon certain sacred centers of the Earth. At those temples it is necessary to access the sacred energy emanating from the Earth itself, more so than the temple. The Sphinx works through the universal spectrum of the Mazzaroth. The definition of Mazzaroth as I interpret it through Thoth’s Record are the 12 threshold nodes or controlling points of the zodiacal universe of our reality. Each threshold node corresponds to one of the zodiacal signs. The Mazzaroth is the ‘pattern of integrity’ which circumscribes the path of karmic resolution within the current Earth geometry merkabic vehicle. The Mazaloth is the unfolding of star fields into greater and greater thresholds of divine formation within this universe, which is accomplished through key manifolds maintained within the stars of the visible spectrum. ‘Mazzaroth’ is the cosmic vehicle to transcend the ‘dark space,’ while ‘Mazaloth’ is the ‘Light Foundation’ of the greater universe. The Guardian of Mazzaroth is both the Guardian and the Messenger of the New Christed Age, which Corinne Heline calls the ‘New Galilee,’ when the present and the future come together in the Heart and Mind. The true Guardian of Mazzaroth is a Morphi ( High Devic nature being, who functions as a generator and guardian for the dynamic powers of Spirit in nature; which includes the natural elementation of the human form.) ...the being we are calling the ‘Guardian of Mazzaroth.’ is an etheric being of Light created by the Archangels of Sagittarius (the ‘Lords of Spiritualized Mind’) to guardian the entrance portals between the Mazzaroth and the Earth. Thus, we see the spiritualized higher mind of the Hierarchy of Sagittarius as being the consciousness which animates the ‘Guardian,’ setting its spiritual presence in attendance for the preservation of the Mazzarothic thresholds. Sagittarius is a sign of transition and has transmutation as a keynote. As this sign sits between the ‘dragon power’ of Scorpio and the ‘Christed Sun’ of Capricorn, it represents the power center for the Great Work. The Biblical key for Sagittarius is quoted from St. Paul: “Let this mind be in you which was also in the Christ Jesus.” (Ref: Corinne Heline’s New Age Bible Interpretations, Old Testament, Vol. II.) In other words, the reference is to the highly spiritualized mind which Sagittarius holds for the planet as a Hierarchical presence, and which the Christed Jesus exemplified. To summarize the above: the Sphinx is a powerful symbol and dynamic of the Solar Logos. It is imbued with the presence of the Morphi Being we are calling here the Guardian of the Mazzaroth. The Sphinx is located on a planetary threshold node that is a portal through the constellation of Leo (the star Denebola) into the Golden Star of Mazuriel in the Attasic Universe. Now I begin with the most recent understanding of the Sphinx as a template for the future human form, or what Thoth refers to as the Pure Gem body. In January of 2006 I was shown how the physical Sphinx is merely an outer shell for a stellar geometry of the future Pure Gem body. This body is NOT a lion’s body...but it does contain an energetic correlation with the Sun Lords who guardian the Telos.Aarkhara capstone of the universal “Eye of Ra”. The Pure Gem body is human as we understand it. Yet it radiates the celestial patterns of all species from the divine heart-mind of God. I first received knowledge on the Pure Gem Body in the 1970's, when I wrote through akashic transmission the as yet unpublished work: The Pure Gem Codex. Now I am being shown how the supernal ‘Sphinx’ as a seed-point for the Guardian of Mazzaroth is an open-ended matrix for re-calibrating the current human form into future stages of Pure Gem realization. By this it is not meant that working with the energies of the Sphinx, so you will receive your Pure Gem body right now. This future form is developed by us not only as individuals, but as a collective whole. It moves with the currents of planetary evolution. However, individuals may receive advanced crystalline formation within the DNA that will create thin crystalline shales of LIGHT in the body, allowing a level or degree of additional formation of the Pure Gem frequency to take place. In some cases, enough to actually change the physical form. Such beings as Yeshua, Buddah and Baba Ji have experienced this process. They knew and lived the “Mystery of Mazzaroth” and thus the Sphinx. It was revealed to me that there is a collection or order of beings which Thoth calls the Nefer’Ratem who guardian the Sphinx and it’s energetic threshold. They also work with that threshold in keeping it active and current with the world dynamic. It is a time portal as well, for all time as we know it is calibrated through the Mazzarothic Threshold, and the Sphinx is a seed-conduit for that threshold. I then asked Thoth how people might be able to work with the Sphinx as a capacitator for the Pure Gem body for healing, deeper revelation of the divine in human form, and accelerating the growth of the crystalline sheaths in the DNA. He then showed me a table of golden plates, each inscribed with certain geometries and images. This table he calls the Hyrim E’baph. According to what I receive from the Records of Thoth, the Hyrim E’baph is a physical psionic template that remains in a chamber beneath the paws of the Sphinx. Each plate on the table contains the dynamic and interactive coding necessary to quicken an aspect of the building of the Pure Gem body. Thoth explained to me that were I to re-create a facsimile of these plates through my digital energy-art, individuals could use them to attune to and work with the frequencies of the A’tum, which is Thoth’s word for the higher energy body of the Sphinx, which forms a seed-point into the actual Threshold of the Mazzaroth. It is my intention therefore to explore creating these energy-art versions of the Hyrim E’baph. This grouping of souls, number 286 in all once were in physical incarnation on this planet in the service of the A’tum (although not incarnated all at the same time). They now hold the grid of the A’tum in their energy bodies on higher levels of vibrational existence. They do ‘appear’ in their once-human forms on occassion, usually near the Sphinx. While I have not had any verification of this, Thoth relates to me that some of the Nefer’Ratem have been seen and heard by persons on the Giza plateau, usually at night. "The Sphinx, while clearly associated with the dual god Ra-Tem...very definitely represented man as an emergent god." When writing this article I did not know of any Egyptian god named "Ra-Tem", much less that it was associated with the Sphinx! Further, John Gordon writes that Ra-Tem, as the "downward-pouring 'serpent fire' from the solar heaven -- divides itself as Tefnut and Shu -- the self-born 'lion-headed gods'." I see these "lion-headed gods" as Solar Lord guardians of the pyramidical Telos.Aarkhara. which 'capstones' the Universal Tear revealing the Eye of Ra or Heliomar. Gordon also writes at length on the 'Eye of Ra', from whence man "was born amidst his 'tears'." It is also interpreted as a 'radiance' streaming from the Eye of Ra. The Sphinx, then is the guardian to the pyramids (most specifically the Great Pyramid), just as the lion-headed Sun Lords guardians the pyramidical capstone over the Eye of Ra. But the Sphinx is a human-headed lion, reflecting it's higher dynamic of opening the "Eye" in the human mind, in order for humanity to become as the Gods.